We are one of the eminent manufacturers and suppliers of a wide range of Constant Current Battery Chargers. Based on HF switching technology, the proffered series is manufactured in accordance with the set industry guidelines. It provides protection against short circuit, phase, neutral, earthing and reverse polarity. Handed over in safe packaging, the proffered range is quite portable and efficient. Being one of the preferred choices of our customers, we are engaged in proffering Car Battery Chargers that is suitable for cars, boats and D.G. set batteries. Owing to the optimum resistance to short circuit and reverse battery protection, the proffered assemblage is extremely popular in the business. Based on series regulated technology, the proposed compilation is efficient and reliable in performance. 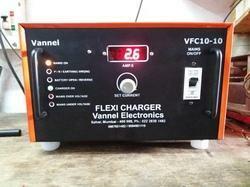 Constant Current Charging irrespective of mains fluctuations. •Operates on 230VAC +10% 1Ph. 50Hz. Our company is considered a renowned name in the industry that manufactures and supplies Motorcycle Battery Charger. Handed over in safe packaging, the proposed selection is easy to operate. 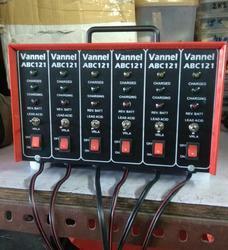 These battery chargers perform accurate testing and charging of valve regulated lead acid batteries. 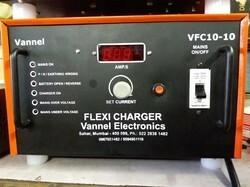 Made available in standardized specifications, these efficient chargers ensure that all batteries are charged properly. 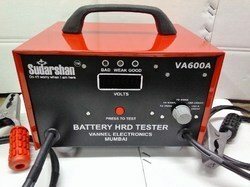 Being one of the renowned names of the business, we bring forth Battery HRD Tester that finds a major application for testing batteries of four wheelers. Made available in standardized size, the proffered series operates under optimum load capacity and comes with heavy-duty battery clips. Tested for its flawlessness before the final transmission, the selection is quite easy to operate and gives reliable performance. The LED voltmeter has 3½ digit LED display, which is powered by the battery under test. It has a range between 8-20V and is useful for testing 12V battery & charging system. 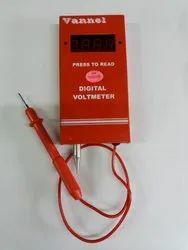 The LCD voltmeters are powered by a 9V battery & can test from 0-20V and 0-200V. To prevent the battery from accidental discharge, a push button switch is provided for use while operating the voltmeter. 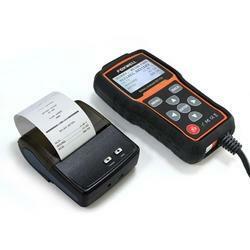 We are considered a renowned name in the business that manufactures and supplies High Rate Discharge Tester. Vastly used for testing batteries of two wheelers, these efficient and high functionality machines come with battery status indicator. Manufactured in adherence to the preset industry guidelines, the proffered selection is portable, tough in construction and requires less maintenance. We are one of the leading manufacturer of Constant Current Battery Chargers for Electrical Industry for our esteemed clients. Our offered range of products are widely demanded by our clients at various market leading and affordable prices. 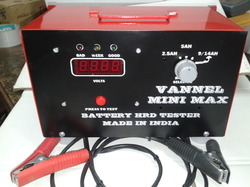 Since our inception in the year 1994, we Vannel Electronics are recognized as a trustworthy manufacturer and supplier of a remarkable array of Battery HRD Testers & Chargers. Our range consists of Constant Current Battery Chargers, Battery Chargers, Motorcycle Battery Charger. These products are developed using quality assured raw material with employing advanced technology. The range we offer is available in varied sizes, designs and technical specifications as per the diverse needs of patrons. Our products are acknowledged for their excellent performance, high energy efficiency and shockproof nature. We manufacturer our products rang under the brand name of Sudershan. We are a customer based firm that aims at maximizing the satisfaction level of honorable patrons in all the aspects. To regulate the process of financial transactions, we accept payments through variegated simple modes like cash, cheque and DD. Our experts work in harmony with one another as well as with patrons to know their needs and serve them products accordingly. All our experts are well-versed with the every pros and cons of their respective working departments thus, helping them in successfully completing the assigned tasks. Our nominally priced products, scheduled delivery of orders and customer focused approaches have enabled us to win the faith of numerous patrons throughout the nation.